Disclosure: We received a sample to facilitate our honest review. No monetary compensation was received! All opinions stated are those of the Shelly's Bits and Pieces family. Sponsor is responsible for prize fulfillment! Our commitment to baking quality biscotti is not just talk. Nonni’s products are made in the manner of a traditional bakery, where no shortcuts are taken. Our biscotti contain a combination of real butter, whole egg, flour and a selection of other premium ingredients including superior quality chocolate and nuts. Our almond thins are loaded with premium nuts and made with real fruits including cranberries, raisins, mangos, bananas and blueberries. We use only the finest ingredients and we never use artificial flavors or preservatives. Each batch is made to the highest quality standards to ensure a consistent product every time. Shelly's Bits and Pieces has been lucky enough to work with Nonni's in the past on some of their delicious products! I have never been shy to tell you how delicious they are and how much we love them. 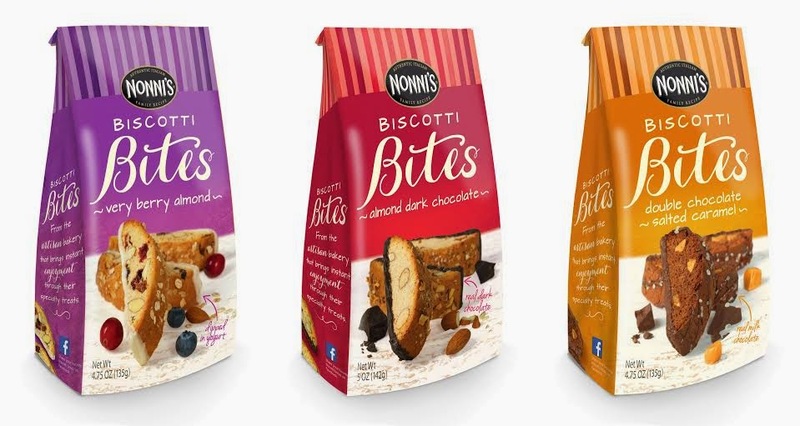 Recently, we were sent the new Nonni's Biscotti Bites to try and it was love at first bite. We were sent a wonderful package which contained three flavors, Almond Dark Chocolate, Very Berry Almond and Double Chocolate Salted Caramel. These bites are the perfect size to go with a quick cup of coffee or tea when you need a little pick me up. The fact that they are under 40 calories each is just the icing on the cake. Almond Dark Chocolate: A mini version of the Classic Almond Biscotti, filled with almonds and dipped in rich, dark chocolate. Very Berry Almond: A fruity biscotti mini, filled with real berries and almonds, dipped in Greek Style Yogurt and topped with rolled oats. Double Chocolate Salted Caramel: A delicious little indulgence, filled with creamy caramel bits, dipped and drizzled in milk chocolate and sprinkled with sea salt! All of these are delicious. Kat came home just as these arrived and she grabbed a couple of the Almond Dark Chocolate. She loved them! Chefy came in and took the bag away from her. By the end of the evening, he had wiped out the bag. I thought I had hidden the Double Chocolate Salted Caramel bites, but Kat found them, gave me two, and disappeared with the bag. I found the empty bag several days later in her bedroom trash can. Since they devoured the chocolate ones, I figured I would at least get the Very Berry Almond ones. These are delicious too. Although they are not as crunchy as the others, they were wonderful with my tea. We managed to keep a few of the Very Berry Almond biscotti bites around long enough for my mom to give them a try. She is not a chocolate person, so it worked well. She loved them! We agreed that the Very Berry Almond have the perfect amount of "sweet" to them. They are not overly sweet, and they are very addictive. Want to give them a try? One lucky Shelly's Bits and Pieces reader will win a bag of each flavor! Simply enter on the rafflecopter form below! Also, while you are out entering things, you might want to check out their facebook giveaway too. Now that the kids are heading back to school, it’s time to get your morning back! 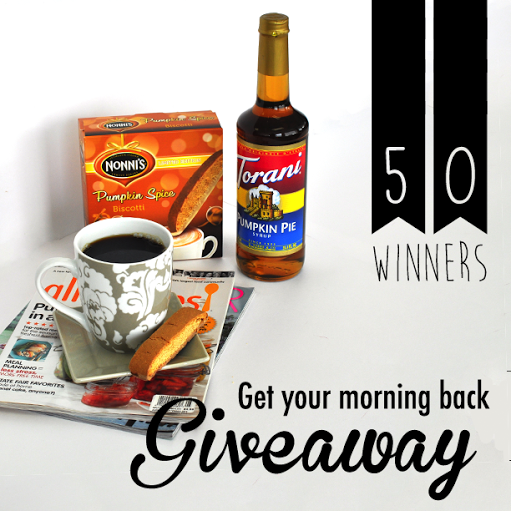 Nonni’s is teaming up with Torani to make your morning extra special with a chance to win a box of our limited edition Pumpkin Spice Biscotti and a bottle of Torani’s Pumpkin Pie syrup! Enter now through August 31st. I would like to try Very Berry Almond the most. I would love to try the Very Berry Almond...sounds delicious! Thanks so much for hosting this giveaway! Very Berry Almond is the one I really want to try.